The inspiration for this Cwrlyd Llechen came originally from seeing the ornate slate roofs of Normandy. I was aware of the ornate slate roofs of North Wales, but had not seen roofs on this scale (whole villages) and intricacy. Being on holiday with my family (which included my son in law Kaz, a heritage slate roofer working in Blaenau Ffestiniog), meant that we spent a lot of time studying these roofs. The intricate patterns of the overlapping slates and the way they were moulded to the overall roof shapes, made them look more like soft, carefully laid covers or patchwork quilts. There was a similarity in the repeated patterns that is inherent to both techniques. Slate roofs with their origins in the quarries have always been associated with men whereas the quilt which has always had a domestic history is a skill always associated with women. Could these two skills be brought together? The Welsh patchwork quilt was mainly made by poor but practical women, it was a way of using scraps of fabric and of extending the life of clothing. The craft was drawn from the environment both in a practical sense, using wools a material and in the repeated geometric forms of the patterns. There were many conceptual echoes with the fragment and pattern of the mapping of the quarry landscapes. When we were researching and exploring the Rhiw Bach quarry village, I came across an old rusty iron bedhead in one of the old houses and was struck by how this one object bore witness to the life that had existed there. The domestic bed, and its role within the lives of both quarry men and women was one of the few objects that they both shared. And so the concept of the slate quilt came to the forefront. Keeping to the traditional approach of recycling material most of the slate pieces were hand cut from old roofing slates. It certainly was a huge learning curve, in both using the tools and learning about the qualities of the material itself. Most of the recycled slate was from the Blaenau Quarries with a few of the Penrhyn purple added to expand the colour range. Many of the slates were naturally patinated by lichens, having been on a roof for possibly over a 100 years. I wanted to preserve these older pieces to convey a quality of time. I experimented with all these and found that the French scissors were the most versatile tool for cutting the thinner curved shapes, with the guillotine better for the straighter thicker pieces. Unfortunately, Blaenau slate is thicker and coarser than some of the other quarries and so began a very long process ….with a lot of rejects. I was constantly aware of the weight of this amount of slate and how to practically keep it to a minimum so that it had the appearance of fabric more than a slate roof panel. During the process of making, I decided to contrast the traditional method of cutting slate by hand by introducing the more contemporary sawn cut edge for some of the shapes. 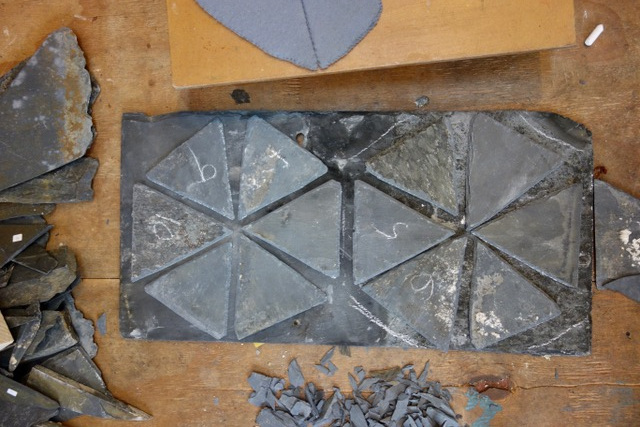 The slate used for these diamonds and triangles, was quarried recently from Gloddfa Ganol in Blaenau Ffestiniog, with the freshly cut slate being more uniform in colour. Side panels using mainly triangles and diamonds. A common geometric shape used to create pattern in Welsh quilts. The slate scalloped forms are used on ornate roofs but mainly overlapping each other. In keeping to the vocabulary of roofing materials, I decided to use butyl rubber as the base for the slate pieces. This is a material used for flat roofs, for its strength, durability and waterproof qualities, all that I needed for my quilt. It was also perfect for my pillows. ‘Y Cwrlyd Llechen’ installed and seen for the first time (with pillows). It can also be installed outdoors. As this work progressed, so did the reflective analysis that pattern is more than a visual organisation of component parts, the repetition and geometry was a strong connection with my idea of mapping of the quarry landscape. The practical nature of the work, the strength and skill needed, gave valuable (if limited) insight into what working with slate is really like. The making of this quilt has been a rather controlled process to a certain extent. I look forward to being able to install it at, some point, outside in the elements, which are beyond my control, and to witness its transformation.